As reported by online source, Google will be helping more users in avoiding sites which post deceptive ads and content has begun blocking website that tend to do so, to ensure that users do not indulge in fake download button. This may appear right near the real download button or pup-ups, challenging phone tech support to remove million malware infections which may be deceptively found on the computer. The blocking would take place through Google’s Safe Browsing tech that one would have perhaps seen earlier. It is the big red interstitial which seems to appear when one clicks on a dodgy search result. Safe Browsing has been for some time though it only prevents the user from visiting sites which were serving up malware or sites which Google had considered unsafe. However, in November, Google had begun blocking sites that utilised `social engineering attacks, in order to get the user to install unwanted software or to reveal sensitive information. Presently Google has been expanding that to websites which tend to serve up deceptive embedded contents. The new block, specially is against deceptive embedded content which translates to `deceptive ads’. When searching for something, the sites with the shady misleading ads which tend to claim that you need to install a certain type of plugin, product or a toolbar would generate a big red scary unfriendly STOP screen, misleading the user to a deceptive button. This is a development to a change which Google has made to search returns back in November when it began blocking sites it envisaged were utilising some type of social engineering attack to make you divulge information which otherwise one would not reveal. As Google had explained on its Online Security Blog, sites that have any kind of ads which deceptively attempt to imitate actual site functionality would now be considered as `social engineering’. This would comprise of fake download buttons, cautioning that software that one has is `out of date’ and fake notifications to update like Flash player. 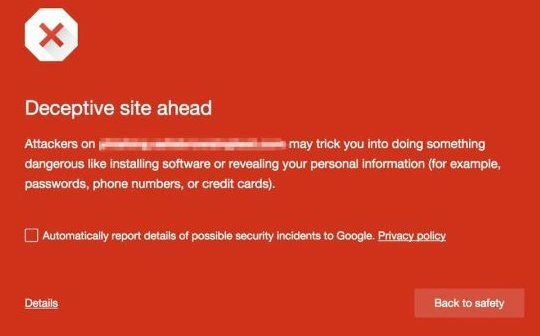 Whenever a site tends to use this tricks, Google would be displaying a big red warning prior to the visits of the site by the user. This would discourage shadier sites from utilising underhand attempts to trick users on clicking on ads or make attempts in preventing them from getting tricked. For the webmasters, this change would be especially difficult. Hosting of deceptive content on the site is one thing though deceptive third party content served by casual ad server would be a bit difficult to police. Webmaster knowledge base of Google does not seem to provide much help, though to note that `ad networks could be rotating the ads shown on the site’s pages. Hence it could be essential to refresh a page a few times prior to viewing any social engineering ads that appear. For the others, this would be a longed-for change. Though the usage pattern seem to be unstable, Google Search tends to drive billion of website clicks each day and several of these websites tend to still depend on Google traffic to stay afloat and this could be the start to an end for fake download buttons.